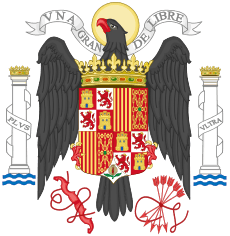 The current coat of arms of Spain, although it has its roots centuries ago, was approved by law in 1981, when the present established version replaced the interim version which, in turn, replaced the official arms of Francoist Spain. The coat of arms appears in the flag of Spain. 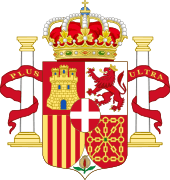 The Spanish coat of arms symbolizes the country, the old kingdoms of Spain, the Royal Crown, the Imperial Crown, the Constitutional monarchy, the Spanish national motto: Plus Ultra, and the Pillars of Hercules with the Spanish geographic situation. The Monarch, the heir to the throne and some institutions like the Senate, the Council of State or the General Council of the Judiciary have their own arms. Quarterly, first quarter Gules a triple-towered castle Or masoned Sable and ajoure Azure (for Castile); second quarter Argent a lion rampant Purpure crowned Or, langued and armed Gules (for León); third quarter Or, four pallets Gules (for the former Crown of Aragon), fourth quarter Gules a cross, saltire and orle of chains linked together Or, a centre point Vert (for Navarre); enté en point a pomegranate proper seeded Gules, supported, sculpted and leafed in two leaves Vert (for Granada); overall an escutcheon Azure bordure Gules, three fleurs-de-lys Or (for the regnant House of Bourbon-Anjou); for a Crest, a circlet Or, jewelled with eight breeches of bear or oyster plant leaves, five shown, with pearls on points Or inserted and above which rise arches decorated with pearls and surmounted by a monde Azure with its equator, its upper half-meridian and a latin cross Or, the crown capped Gules (the Spanish royal crown); for Supporters, two columns Argent with capital and base Or, standing on five waves Azure and Argent, surmounted dexter by an imperial crown and sinister the Spanish royal crown, the columns surrounded by a ribbon Gules charged with the Motto 'Plus Ultra' written Or (the Pillars of Hercules). Gules, a three towered castle Or, masoned sable and ajouré azure. Argent, a lion rampant purpure (sometimes blazoned gules) crowned Or, langued and armed gules. Gules, a cross, saltire and orle of chains linked together Or, a centre point vert. Argent, a pomegranate proper seeded gules, supported, sculpted and leafed in two leaves vert. Oval in the official version. 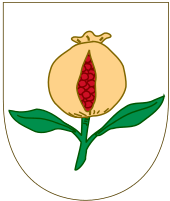 "Correct" version of the Arms, depicted according to the request of Spanish heraldists. The official design of the coat of arms of Spain is alike as a logotype. It has been set in a linear way: drawing, proportions of elements and colours (CIELAB). This approach has been criticised by Spanish heraldists for various reasons. First, the coat of arms pattern is so simplified compared to the heraldic uses, that considers relevant the way of representing both charges and tinctures because they must be easily identifiable without error. However, the colours determined by the decree are little visible. In particular, Or and Gules have been represented respectively so intense and too dark they do not allow for a clear distinction of the charges. The chosen colour to represent Purpure is also criticised for being of a pinkish hue, unlike traditions of the former Kingdom of Leon and heraldic customs. Second, Spanish heraldists have also expressed some inaccuracies related to the style and the drawing of the official design, beyond the Iberian heraldry traditions. Escutcheon shape is midway between the modern French style, rectangular with a slightly convex bottom edge, and the Spanish with an almost semicircular bottom edge. 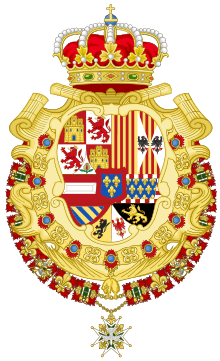 Enté en point of the arms of Granada is also represented as the French tradition with slightly convex top edges instead of sharp curved top edges according to Iberian Heraldry tradition. 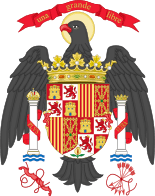 Finally, the inescutcheon superimposed over the main shield is oval shaped (different from the escutcheon shape), this circumstance is considered imprecise by many Spanish heraldists. The Arms of the Kingdom of Spain was the official coat of arms of the Monarch of Spain from the time of the Catholic Monarchs, and was used as the official arms of the Kingdom until the First Spanish Republic in 1873. Afterwards, the arms became an integral part of the Coat of Arms of Spain. The different governments since (whether republican or monarchist) have led to the arms being changed on various occasions, but always respecting the main heraldic design involving the former kingdoms and, in many cases, the pillars of Hercules. As a reward for his successful voyage of discovery, the Spanish sovereigns granted Columbus the right to bear arms. According to the blazon specified in letters patent dated May 20, 1493, Columbus was to bear in the first and the second quarters the royal charges of Castile and Leon the Castle and the Lion but with different tinctures or colors. In the third quarter would be islands in a wavy sea, and in the fourth, the customary arms of his family. 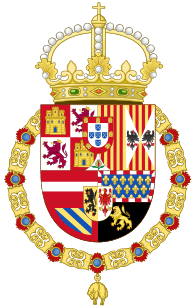 Coat of arms of the Catholic Monarchs after 1492. 2 and 3. per pale Aragon and Aragon-Sicily. The arms were borne by the eagle of Saint John, sable, with an open royal crown. After Isabella I's death in 1504 Ferdinand used different arms, namely tierced per pale Castile-León, Aragon-Naples-Sicily, and Aragon. The annexation of Navarre (1513) brought about the final change in the arms of the Rey Católico (Catholic King): the second quarter was changed to: per pale, 1. per fess Aragon and Navarra, 2. per fess Jerusalem and Hungary. 4. quarterly Castile and León; enté en point Granada. The arms used in Aragon were either Aragon, or per pale, Castile-León and Aragon or tierced per pale, Aragon-Sicily, Aragon and tierced per pale Hungary, Anjou-Naples and Jerusalem.In Naples, the arms were Quarterly, 1 and 4. Castile-León, 2. per pale Aragon and per pale Jerusalem-Hungary; 3. per pale Aragon and Aragon-Sicily. 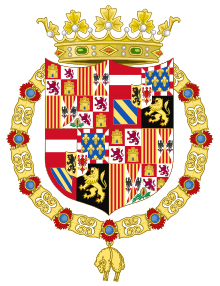 Coat of arms of Philip I of Castile. Coat of arms of Charles I. At the death of Isabella I of Castile in 1504, Archduke Philip the Handsome immediately staked his claim to her inheritance by quartering his own arms with those of the Catholic Monarchs. He had previously borne quarterly: Austria, Burgundy modern, Burgundy ancient and Brabant, with an escutcheon overall per pale Flanders and Tyrol. Since his highest title was archduke and the Spanish titles were all royal, the Spanish quarters were given precedence over his. Hence the arrangement became, quarterly: 1. and 4. grand quarters, quarterly: A. and D. quarterly Castile-León, B. and C. per pale Aragon-Sicily, the grand quarter enté en point for Granada; 2. and 3. grand quarters, quarterly Austria, Burgundy ancient, Burgundy modern, Brabant, with an escutcheon per pale Flanders and Tyrol. Charles I marshalled his arms in a number of ways. In the first years of his reign, he most frequently used the same arrangement as his father. After his election as Holy Roman Emperor in 1519 he placed it on the breast of an imperial eagle. Later in his reign a simplified version appears. The arms are per fess with the Spanish quarters in chief and the Austrian quarters in base. This version became very popular in the Netherlands. There it is often seen with the imperial eagle placed on a golden shield, ensigned with the imperial crown and supported by a lion and a griffin. The Order of the Golden Fleece then hangs suspended round the main shield. In other parts of his extensive monarchy, a number of variations are to be found. Many concern the way in which the Aragonese realms are represented and therefore probably relate to the Crown of Aragon or to one of its constituent parts. In 1516 for instance, he is found using arms quarterly of Spain (quarterly Castile-León and Aragon-Aragon-Sicily, with Granada enté en point) and Austria (quarterly Austria, Burgundy modern, Burgundy ancient and Brabant) with an escutcheon overall per pale Flanders and Tyrol. In 1520, the quarter of Aragon and Aragon-Sicily are replaced per pale Aragon and Naples (per pale Jerusalem and Hungary). After 1530 some versions display quarterly: 1. and 4. grand quarters Spain, which is quarterly A. and D. Castile-León, B. and C. per pale a. per fess Aragon and Navarra, b. per pale Naples (Jerusalem and Hungary); 2. and 3. grand quarters Austria, (as above); enté en point Granada. These arms are borne by an imperial double-headed eagle sable, surmounted by an imperial crown, surrounded with the collar of the Golden Fleece and accompanied by the pillars of Hercules and the motto PLUS ULTRA. In Sicily on the other hand, Emperor Charles V used quarterly 1. and 4. Castile-León, 2. tierced per pale Aragon, Jerusalem and Hungary, 3. per pale Aragon and Aragon-Sicily, enté en point Granada. Overall in chief a double-headed eagle sable crowned or bearing an escutcheon of Austria. Later, his arms in that realm were quarterly, 1. Castile-León, 2. quarterly Aragon, Aragon-Sicily, Navarra and Aragon, 3. quarterly Austria, Burgundy modern, Burgundy ancient and Brabant, overall an escutcheon per pale Flanders and Tyrol; 4. per pale Naples (Jerusalem and Hungary); enté en point Granada, these arms borne by an imperial eagle. 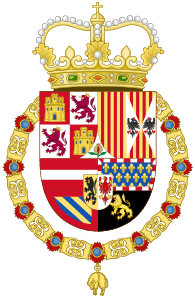 During the reign of King Phillip II the arms of the Spanish Monarchy become fixed for the remainder of the House of Austria. Originally Philip II used the simplified arms as deviced for his father, namely per fess with the Spanish quarters in chief and the Austrian quarters in base. After the unification with Portugal in 1580 (due to the death of the Portuguese king), the arms of the Monarchy became per fess, in chief per pale, A. quarterly Castile and León, B. per pale Aragon and Aragon-Sicily, the whole enté en point Granada and with an escutcheon of Portugal on the honor point; in base quarterly Austria, Burgundy ancient, Burgundy modern and Brabant, with an escutcheon (in the nombril point) per pale Flanders and Tyrol. The arms were crowned with a royal crown with three visible arches and the Order of the Golden Fleece was suspended round them. In the Netherlands the arms were regularly supported by two golden lions guardant. Even though Portugal and its possessions were lost in 1640, the Spanish kings retained the use of the Portuguese arms as arms of pretence until 1668. * Pillars of Hercules version. * Golden Fleece and Mantle version. Middle coat of arms of Joseph Bonaparte. 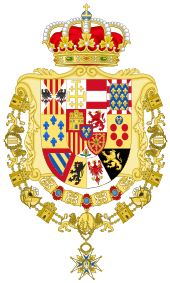 Coat of arms of Spain during the reign of Amadeo. Philip was born in Versailles. He was made the Duc d'Anjou upon his birth. He was the second son of Louis, le Grand Dauphin. In the year 1700, the King of Spain, Charles II, died. Charles' will named the 17-year-old Philip, the grandson of Charles' sister Maria Theresa, as his successor. Upon any possible refusal the Crown of Spain would be offered next to Philip's younger brother Charles, Duke of Berry, or to Archduke Charles of Austria. Both claimants had a legal right due to the fact that Philip's grandfather, Louis XIV of France and Charles's father, Leopold I, Holy Roman Emperor, were both the husbands of Charles' older half sisters and sons of Charles' aunts. Philip had the better claim because his grandmother and great-grandmother were older than Leopold's. However the Austrian branch claimed that Philip's grandmother had renounced the Spanish throne for her descendants as part of her marriage contract. This was countered by the French branch's claim that it was on the basis of a dowry that had never been paid. After a long council meeting where the Dauphin spoke up in favor of his son's rights, it was agreed that Philip would ascend the throne but would forever renounce his claim to the throne of France for himself and his descendants. It was not difficult to see whether Louis would have refused anyway as a Habsburg ruler in Spain would've put a possible enemy on three frontiers. per fess: 1. per pale, quarterly Castile and León, enté en point Granada, and per pale, Aragon and Aragon-Sicily; 2. Quarterly, Austria, Burgundy modern, Burgundy ancient and Brabant; enté en point, per pale Flanders and Tyrol. Overall an escutcheon Anjou. The abbreviated arms were quarterly Castile and León, enté en point Granada, overall Anjou. Charles III was the first son of the second marriage of Philip V with Elizabeth Farnese of Parma, he was one of the so-called "enlightened monarchs". Quarterly of six (in three rows of two each): 1. per pale Aragon and Aragon-Sicily; 2. per pale Austria and Burgundy modern; 3. Farnese 4. Medici; 5. Burgundy ancient; 6. Brabant; enté en point per pale Flanders and Tyrol. Overall an escutcheon quarterly of Castile and León enté en point of Granada, overall Anjou. Around the shield are the collars of the Golden Fleece and of the French Holy Spirit (After the Order of Carlos III). The abbreviated arms remained the same (they form the escutcheon en surtout of the state arms). They are accompanied by the Pillars of Hercules and the motto PLUS ULTRA and crowned with the royal crown, but do not show the collars. Already at this time the Anjou escutcheon was sometimes represented without its bordure gules. Joseph Napoleon I (born Corte 1768, died Firenze 1844), king of Spain (1808–1813), was the elder brother of the Emperor Napoleon I. Following his conquests, the Emperor placed members of his family on the throne of various European states, some of them being created accordingly. Joseph was first king of Naples (1806). When Napoleon expelled the Bourbons from Spain, he placed Joseph on the throne and gave the throne of Naples to Marshal Murat, former Commander-in-Chief of the French troops in Spain and husband of Caroline Bonaparte, Napoleon's sister. The long and difficult Spanish War of Independence or Peninsular War, famously illustrated by the painter Francisco Goya, ended with the overthrow of Joseph in 1814. Quarterly of 6, in three rows of two each, 1. Castile; 2. Leon; 3. Aragon; 4. Navarra; 5. Granada; 6. Indies (Gules often Azure, the old and the new world or between the pillars of Hercules argent). Overall an escutcheon with Imperial France's eagle. National Coat of arms, 1875-1931 (Bourbonic Restoration). * Order of the Golden Fleece versión. * Golden Fleece and Mantle versión. 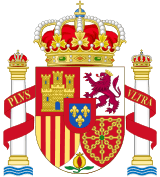 Coat of arms of the Spanish monarch (1931 version). 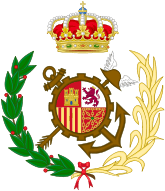 Coat of arms of Spain during the Second Spanish Republic. In 1813 the Allies returned Ferdinand VII of Spain to Madrid. The Spanish people, blaming the liberal, enlightened policies of the Francophiles (afrancesados) for incurring the Napoleonic occupation and the Peninsular War, at first welcomed Fernando. Ferdinand soon found that while Spain was fighting for independence in his name and while in his name juntas had governed in Spanish America, a new world had been born of foreign invasion and domestic revolution. Spain was no longer an absolute monarchy under the liberal Constitution of 1812. Ferdinand, in being restored to the throne, guaranteed the liberals that he would govern on the basis of the existing constitution, but, encouraged by conservatives backed by the Church hierarchy, he rejected the constitution within weeks (May 4) and arrested the liberal leaders (May 10), justifying his actions as rejecting a constitution made by the Cortes Generales in his absence and without his consent. Thus he had come back to assert the Bourbon doctrine that the sovereign authority resided in his person only. 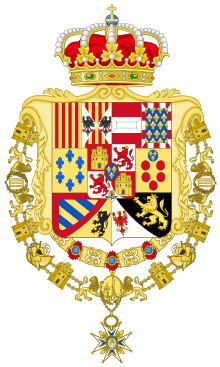 Ferdinand VII of Spain reestablished the arms of Charles III, both the state arms and the abbreviated arms. The Anjou escutcheon became increasingly frequently an escutcheon of France. The First Spanish Republic started with the abdication as King of Spain on February 10, 1873 of Amadeo I of Spain, following the Hidalgo Affair, when he had been required by the radical government to sign a decree against the artillery officers. The next day, February 11, the republic was declared by a parliamentary majority made up of radicals, republicans and democrats. It lasted twenty-three months, between February 11, 1873 and 29 December 1874 and had five presidents: Estanislao Figueras, Pi i Margall, Nicolás Salmerón y Alonso, Emilio Castelar y Ripoll and Francisco Serrano. 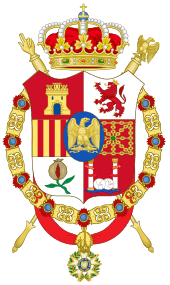 The Provisional Government of 1868 adopted the present territorial arms: quarterly of Castile, Leon, Aragon and Navarre enté en point of Granada. The crown was a mural crown. During the brief reign of Amadeo, the royal crown was reinstated and an escutcheon of Savoy (Gules, a cross argent) was placed en surtout. There were not many Spanish arms including the escutcheon of Aosta (Argent, a cross gules within a bordure compony azure and or), the arms used by Amadeo before his accession to the throne of Spain. Quarterly of 6, in three rows of two each: 1. per pale Aragon-Sicily and Jerusalem ; 2. 2. per pale Austria and Burgundy modern; 3. Farnese 4. Medici; 5. Burgundy ancient; 6. Brabant; enté en point per pale Flanders and Tyrol. Overall an escutcheon quarterly of Castile, Leon, Aragon and Navarra enté en point of Granada, overall France. The Republic of 1931 used again the territorial arms as in the First Spanish Republic but depicting in the secondquarter an uncrowned lion. The Spanish Civil War officially ended on 1 April 1939, the day Francisco Franco announced the end of hostilities. The Republican democratically elected government had been defeated and Franco became the undisputed dictator of Spain. He ruled Spain until he died on November 20, 1975. The Nationalist senior generals had held an informal meeting in September 1936, where they elected Francisco Franco as leader of the Nationalists, with the rank of Generalísimo. He was originally supposed to be only commander-in-chief, but after some discussion became head of state as well with nearly unlimited and absolute powers. Quarterly, 1 and 4. quarterly Castile and León, 2 and 3. per pale Aragon and Navarra, enté en point of Granada. The arms are crowned with an open royal crown, placed on an eagle displayed sable, surrounded with the pillars of Hercules, the yoke and the bundle of arrows of the Catholic Monarchs. 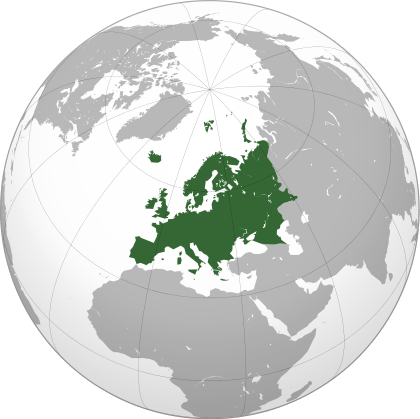 1 2 (Spanish) Act 33/1981, 5 October (BOE No 250, 19 October 1981). 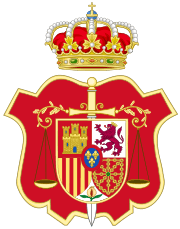 Coat of arms of Spain. 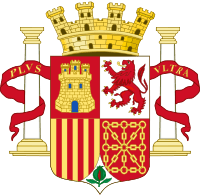 ↑ Coat of arms of His Majesty the King of Spain. The Royal Household of the King of Spain. Retrieved 14 December 2013. ↑ Parker, James. A Glossary of Terms Used in Heraldry, (2nd ed.). Rutland, VT: Charles E. Tuttle Co. ISBN 0-8048-0715-9. ↑ Menéndez Pidal y Navascués, Faustino; O'Donnell y Duque de Estrada, Hugo; Lolo, Begoña (1999). Símbolos de España [The Symbols of Spain]. Madrid: Centro de Estudios Políticos y Constitucionales. p. 255. ISBN 84-259-1074-9. ↑ "Columbus' Coat of Arms". Library of Congress. Retrieved March 18, 2015. This article incorporates text from this source, which is in the public domain. 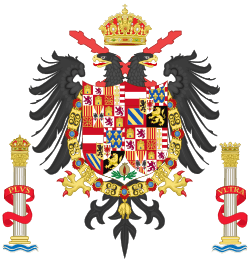 ↑ (Spanish) Kingdom of Naples arms in the heraldry of Ferdinand II of Aragon as King of Naples, De Francisco Olmos, José María, La moneda napolitana de Fernando el Católico, documento porpagandístico de la unidad de las coronas; . Madrid (2001), p.156. Centro de Estudios Políticos y Constitucionales, Símbolos de España (Madrid, 2000). Hubert De Vries, Wapens van de Nederlanden (Amsterdam, 1995). 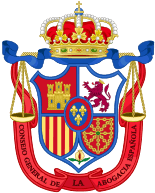 Wikimedia Commons has media related to Coats of arms of Spain.